A new project in Detroit will upcycle 93 shipping containers into a luxury multi-family home, aptly named The Power of Green Housing Development. Designed by Steven C. Flum, the sprawling development will span four floors, and it will include 20 residences of varying size. 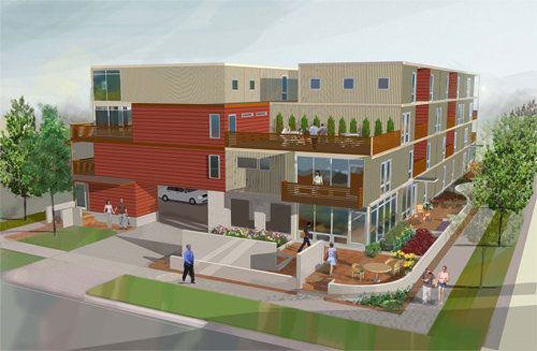 The apartment complex will be the first luxury multi-family home in the United States made from shipping containers. The condominium units will be available in studio, 1-, 2- and up to 3-bedroom units. With sizes from 960 to 1,920 square feet, the apartments will reach luxury status in spaciousness alone. The residents will also have their own covered parking garage, which will run along the ground floor, with cantilevered apartment units doubling as the garage’s roof. The disused storage containers will be stacked to allow natural shading and outdoor areas, creating private balconies and terraces for each unit to enjoy on each floor. Each unit also uses tankless water heating and ducted reverse cycle air, keeping energy costs low. The increased density of the project compared to single-family homes will make it more cost-effective. Coupled with efficiency and cost effectiveness for the construction of each unit, the project could prove valuable to other areas around the country. Over 21,000 shipping containers are brought into the United States each day. 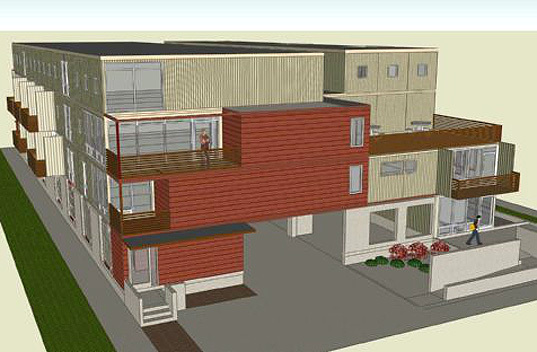 With the power of Green Housing Development, Flum hopes to create a usable design to alleviate the disused containers. I would Love to work and receive more information about the project.